And I bear you on eagles' wings. That this signifies and that thus by means of truths they were raised to heavenly light, is evident from the signification of "bearing anyone on eagles' wings," as being to be raised on high even into heavenly light; for by "bearing" is signified to be raised, by "wings" are signified spiritual truths, and by "an eagle," the rational as to truth. (That "an eagle" has this signification, see n. 3901, for eagles fly on high.) For by the visible heaven the ancients understood the angelic heaven. Moreover the simple believed that there was the home of the angels, and also that on high, because nearer the sun and stars, was heavenly light itself. Hence it is that "to be borne on eagles' wings" denotes to be borne on high into that light. That raising thither is effected by means of the truths of faith, is because the truth of faith is what raises man even to heaven, where its good is. That the rational as to truth is "an eagle," is because the rational of man is his heaven, and the natural is relatively like the earth, for the rational constitutes the internal man, and the natural the external man. Every cherub had four faces, and every one of them had four wings; their wings were erect, the one toward the other; every one had wings that covered their bodies. I heard the sound of their wings like the sound of great waters, like the voice of Shaddai; when they went, a voice of tumult like the voice of a camp; when they stood, they let down their wings. I heard the voice of their wings kissing one another, and the voice of the wheels beside them. The voice of the wings of the cherubs was heard even to the outer court, as the voice of God Shaddai. The likeness of the hands of a man was under their wings (Ezek. 1:6, 23, 24; 3:13; 10:5, 21). That here "wings" denote truth Divine is evident from each particular of the description, as well as from the fact that the wings were erect the one toward the other, that they covered their bodies, and that the sound of them was heard like the sound of great waters, like the voice of wheels, and like the voice of Shaddai, and also that the likeness of the hands of a man was under their wings. That the wings were "erect the one toward the other" represented the consociation of all in the Divine; that they "covered their bodies" signified that the Divine truth was a covering to the Divine good from which it proceeds. For the Divine good is a flame, and the Divine truth is the light therefrom, encompassing and thus covering the flame. The flame itself does not appear in heaven, but only the light in which the flame is, and which is thus perceived as heat, which is love. That "a sound was heard like the sound of great waters" signifies the quality of Divine truth in heaven; in like manner "its voice like the voice of wheels, and like the voice of Shaddai;" for "sound" and "voice" are attributed to Divine truth. It is therefore said, "the voice of great waters," because "waters" denote truths (see n. 2702, 3058, 3424, 4976, 5668, 8137, 8138, 8568), as also "the voice of the wheels," because "wheels" denote the truths of doctrinal things, for the reason that "chariots" denote doctrines of truth (n. 5321, 5945, 8146, 8148, 8215); and also "the voice of God Shaddai," because "God Shaddai" denotes truth chiding in temptations and afterward consoling (n. 1992, 4572, 5628). "The likeness of the hands of a man under the wings" signified the omnipotence which belongs to Divine truth, because "hands" denote power, and in the supreme sense omnipotence, when they are attributed to the Lord. From all this it can be seen what was represented by the wings of the cherubs that were over the mercy-seat that was upon the ark of the covenant, and by their being expanded upward, and covering the mercy-seat (Exod. 25:20); also what the cherubs represented on the curtains of the tabernacle and on the veil, and likewise in the temple of Solomon; in like manner what they represented round about the new house described in Ezekiel 41:18-20; also what was signified by "the four animals round about the throne," each of which "had for itself six wings round about" (Rev. 4:6, 8); and what by "the seraphim standing above the throne," each one of which "had six wings" (Isa. 6:1, 2). Thus said the Lord Jehovih, A great eagle, great in wings, long in pinions, full of feathers which had broidery, came upon Lebanon, and took a little twig of the cedar, and carried it into a land of traffic; thereafter it took of the seed of the land, and set it in a field of sowing; it took it unto great waters, it sprouted and became a luxuriant vine. And there was another eagle, great in wings and full of feathers, to which behold the vine applied its roots, and sent forth its shoots unto it, in a good field by many waters; it was planted to make branch, and to bear fruit, that it might be for a vine of magnificence (Ezek. 17:3-8). This prophetic utterance describes the setting up again of a spiritual church by the Lord. The "eagle" there spoken of denotes faith; "great in wings and long in pinions" denotes the truths of faith; "broidery" denotes memory-knowledge; growth therefrom is described by "the little twig of the cedar from Lebanon," by "a land of traffic," "the seed of the land in a field of sowing, beside great waters;" the church itself thence arising is "the vine." (That "a vine" denotes the spiritual church, see n. 1069, 5113; and that it denotes the external church, n. 6375; but "the vine of magnificence" which was from the other eagle, denotes the internal church, n. 6376; for the external of the church is described by one eagle, and its internal by the other.) Afterward is described by the prophet in the same chapter how that church which was set up with the ancients was perverted with the Jews. If ye will lie among the ranks, the wings of a dove will be overlaid with silver, and her pinions with yellow gold (Ps. 68:13). "The wings of a dove" denote the truths of faith (that "a dove" denotes faith, see n. 870); they are said to be "overlaid with silver," because "silver" denotes truth from good (n. 1551, 2954, 5658, 6914, 7999). 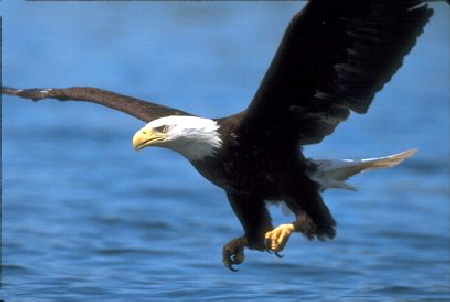 They that await Jehovah are renewed in strength, they go up with wing like eagles (Isa. 40:31). Jehovah shall cover thee under His wing, and under His wings shalt thou confide; truth is a shield and a buckler (Ps. 91:4). "To be covered with the wing of Jehovah," and "to confide under His wings," denote the protection and confidence that belong to faith. The like is meant by being "under the shadow of God's wings" (Ps. 17:8); "confiding in the shadow of His wings" (Ps. 36:7; 57:1; 61:4); and "singing in the shadow of His wings" (Ps. 63:7). Jehovah found His people in a desert land, and in emptiness, in wailing, in solitude: He led him about, He instructed him, he kept him as the pupil of the eye; as the eagle stirreth up her nest, fluttereth over her young, spreadeth out her wings, taketh him, beareth him upon her wings (Deut. 32:10-11). Instruction in the truths and goods of faith is what is here described, and is compared to the "eagle." The very process until man becomes rational and spiritual, is contained in the description and comparison. The comparisons in the Word are all made by means of significatives; thus here by the "eagle," which is the rational. "to be renewed in strength" is to grow as to the willing of good; and "to mount up with strong wing as eagles" is to grow as to the understanding of truth, thus as to the rational. The subject is set forth here as elsewhere by two expressions, one of which involves the good which is of the will, and the other the truth which is of the understanding; and the case is the same with the expressions, "they shall run and not be weary, and shall walk and not faint." Speak a parable about the house of Israel, and say, Thus said the Lord Jehovih, A great eagle, with long pinions, full of feathers, that had embroidery, came upon Lebanon, and took a twig of the cedar; he carried it into a land of traffic, he set it in a city of spice merchants. It grew, and became a spreading vine. There was another great eagle, with great and many feathers; and behold this vine did bend its roots toward him, and sent forth its branches toward him, that he might water it from the beds of its plantations in a good field, by many waters; but it shall be laid waste. He sent his ambassadors into Egypt that they might give him horses and much people (Ezek. 17:2-9, 15). The vision of Daniel: Four beasts came up out of the sea, diverse one from another; the first was like a lion, and had eagle's wings. I held till the wings thereof were plucked, and it was lifted up from the earth and made to stand upon its feet like a man, and a man's heart was given to it (Dan. 7:3-4). The first state of the church is what is here described by a "lion that had eagle's wings;" and the "eagle's wings" here are rational things from what is man's own, on the taking away of which they were given rational and voluntary things from the Divine, which are signified by its "being taken up from the earth, and made to stand upon its feet like a man, and having a man's heart given to it." They had the face of a man, and they four had the face of a lion on the right side, and they four had the face of an ox on the left side, and they four had the face of an eagle (Ezek. 1:10). As for the wheels they were called Galgal [whirling wheels], and everyone and everyone had four faces; the first face was the face of the cherub, and the second face was the face of a man, and the third the face of a lion, and the fourth the face of an eagle (Ezek. 10:13-14). Round about the throne were four living creatures full of eyes before and behind; the first living creature was like a lion; and the second living creature was like a calf; and the third living creature had a face as a man; and the fourth living creature was like a flying eagle (Rev. 4:6-7). That the living creatures thus seen signify Divine arcana, is evident; and consequently so does the "likeness of their faces;" but what arcana in particular are signified cannot be known unless it is known what in the internal sense is a "lion," a "calf," a "man," and an "eagle." That the "face of an eagle" is circumspection and consequently Providence is manifest; for the cherubs represented by the living creatures in Ezekiel signify the Providence of the Lord lest man should enter into the mysteries of faith from himself and his own rational (see n. 308). This shows that when it is predicated of man, the "eagle" is in the internal sense the rational; and this for the reason that the eagle flies high, and from above has a wide view of the things that are below. it is evident that the "eagle" here is reason, which is of intelligence. Such was the signification of the "eagle" in the Ancient Church; for the book of Job is a book of the Ancient Church (see n. 3540, end). Almost all the books of that period were written by means of significatives; but in process of time the significatives have become so completely forgotten that it is not even known that "birds" in general denote thoughts, although they are so frequently mentioned in the Word and it appears quite plain that they have another meaning. Jehovah shall bring upon thee a nation from far from the end of the earth, as the eagle flieth, a nation whose tongue thou hearest not, a nation hard in faces (Deut. 28:49-50). Behold he shall come up as clouds, and his chariots shall be as a whirlwind; his horses are swifter than eagles. * Woe unto us! For we are laid waste (Jer. 4:13). Thy boasting hath deceived thee, the pride of thy heart, O thou that dwellest in the clefts of the rock, that holdest the height of the hill; because thou makest thy nest as high as the eagle I will bring thee down from thence. Behold he shall come up and fly as the eagle, and spread out his wings above Bozrah; and the heart of the mighty men of Edom at that day shall be as the heart of a woman in her pangs (Jer. 49:16, 22). Our pursuers were swifter than the eagles; they chased us upon the mountains; they laid wait for us in the wilderness (Lam. 4:19). Make thee bald, and poll thee for the sons of thy delights; enlarge thy baldness as the eagle; for they are gone into captivity from thee (Micah 1:16). Though thou mount on high as the eagle, and though thou set thy nest among the stars, I will bring thee down from thence (Obad. 4). I am stirring up the Chaldeans, a bitter and hasty nation, that marcheth through the breadths of the land to inherit dwelling-places that are not theirs. Their horses are swifter than eagles;* their horsemen come from far, they fly as an eagle that hasteth to devour (Hab. 1:6, 8). By "eagles" in these passages is signified falsity induced by reasonings, which is induced from the fallacies of the senses and external appearances. That by the "Chaldeans" in the Prophet last cited are signified those who are in a holy external, but interiorly in falsity, may be seen above (n. 1368); also that they who vastate the church are like Babylon (n. 1327); that the "breadths of the land" denote truths (n. 3433, 3434). Vastation is signified by "marching through the breadths of the land." Their "horses" are their intellectual things, which are similar (see n. 2761, 2762, 3217). What the "eagle hastening to devour" signifies, is thus evident, namely, the desolation of man in respect to truths; for the desolation of the church is there treated of. Comparisons are here made with eagles; but as before said, the comparisons in the Word are made by means of significatives. From all this we can now see what is signified by the comparison with the "eagles that will be gathered together to the carcass." Copyright © 2007-2013 A. J. Coriat All rights reserved.